It’s the holiday season. And to all my Afrocentrics, you know what that means: Kwanzaa! To all my non-Afrocentrics, a brief explanation: Kwanzaa is a week-long celebration that originated in Los Angeles during the Black Power Movement of the 1960s. (Not in Africa, as most people believe.) Dr. Maulana Karenga developed it, motivated by the desire to recover a lost sense of black identity through a uniquely African-American holiday tradition that would be rooted in African principles. Most African-Americans don’t even celebrate Kwanzaa, but go ahead and treat my use of Kwanzaa in this article as a stand in for any and all of the ways Black Americans celebrate their African roots in culturally suspect ways. I have to say that, as a Ghanaian-Canadian, when I first came across Kwanzaa, I was like, “Please stop.” The random mash-up of Pan-African referents ranging from East African languages to West African aesthetics reminded me of a kind of cultural showcase found in 19th Century World’s Fair pavilions. Having lived in Chicago for six years now, I get it. I have lived in three countries, and the U.S.A. has been the most difficult place to be Black. I now better understand how systemic acts of state-sanctioned violence and cultural erasure have made it necessary for many Black people to trace their roots beyond the U.S. But while I’ve since gained some new cultural sensitivity, Kwanzaa still doesn’t sit well with me. It’s not because I don’t think the holiday is legitimate because it’s not African—nobody ever claimed Kwanzaa to be. I applaud the purpose of it, I co-sign its anti-consumerist stance, and I high-five the values of community care it attempts to instill. It’s not what Kwanzaa celebrates so much as how it’s celebrated that gives me pause, specifically the position of Africa within those festivities. I suppose I should be flattered at the centrality of the continent in the recuperation of African-American identity. But I’m starting to question what parts of Africa Kwanzaa represents. What parts of Africa do Afrocentrics want to know? It’s clear that not everything that emerges from the continent makes it into the Afrocentrist guidebook. The attempt to reconnect with the continent is actually an attempt to reconnect with an idea of “traditional” Africa, which often means those aspects of African culture that they believe are rooted in a rural past that predates Europe’s arrival. These performances are an act of cultural recovery. They create in the present a connection to a time before the slave trade, and the experiences they could have had if not for European imperialism. Kwanzaa celebrants do things like wear dashikis and boubous and play djembe drums, kalimba, or any of the top ten most popular African instruments. They drape woven mats made of mud cloth, pour libation, and I’ve even heard of some who eat with their hands during their weeklong celebrations. I am tired of seeing the same old African tropes of kente cloth, “umoja,” drums, dance, etc. standing in for authentic connections with the continent and its people. I’m not saying African people don’t do those things anymore (I’m about to go eat some fufu with my hand after I type this), but that’s not all it means to be African today. Africa has changed; please let it evolve. Our culture is just as dynamic as any other, but whenever it is represented in African-American culture, we are always taken up in the same old static ways. We are the Diaspora’s link to their past, a point of origin from which Black Americans can perform their contemporary identities. I remember watching Black Candle, a popular documentary on Kwanzaa, and noticing how easily many of the Black Americans on screen would go back and forth between saying they wanted to connect with African culture, and African history. The two seemed interchangeable in their minds. Africa exists as both a place and time for many African-Americans. This is a result, in part, of the historical relationship between the two cultures, but there is also a contemporary relationship that must be nurtured if it is to survive and deliver on the promise of Pan-Africanism. 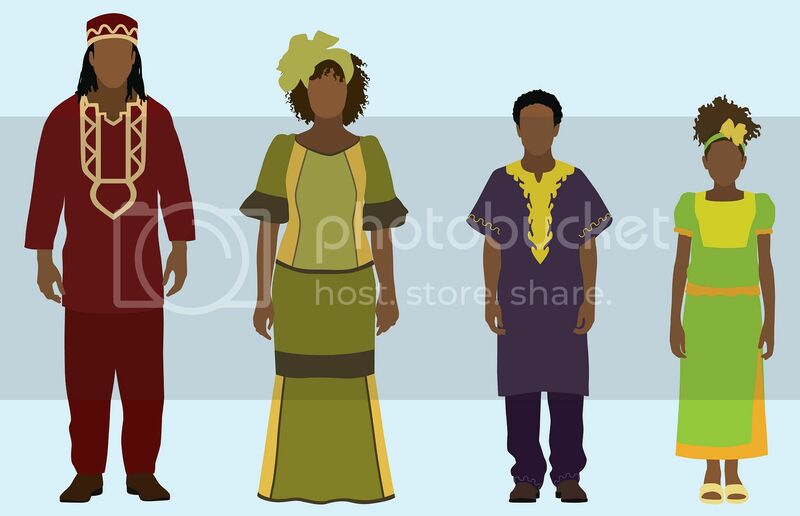 Some of my African-American friends have complained that Africans can be divisive in the ways we draw lines between “us” and “them.” By excluding the Diaspora from wearing African dress for example, we maintain the boundaries initially created by European colonizers between Africa and its Diaspora. I agree. However, the effects of colonialism is not a one-way street. It shapes both African and African-American orientations toward one another. I’m curious about the ways African-Americans’ “return to roots” narratives are shaped by certain Western intellectual traditions that have consistently produced Africans as a people living in a past that is accessible in the present. Africans are familiar with National Geographic portrayals that lock us into reductivist, tribalizing narratives, freezing us in non-evolutionary traditions. It would be nice if African-American depictions of our culture highlighted our growth and diversity. Next time I witness the Diaspora celebrating “African dance,” I’d love to see the Azonto (popular in West Africa) or Pantsula (a Southern African dance featured in Beyonce’s “Girls” video), make the cut. The point of this article is not to slam what I truly believe is a revolutionary cultural celebration. I bring up these issues because the history of Kwanzaa is a dynamic one that can be deconstructed and reconstructed in ever more revolutionary, radically inclusive, and critical ways. What if Kwanzaa included elements of contemporary and urban Africa in its celebration? Some Hiplife music from Ghana, for example, instead of “traditional drumming” from an amalgamation of West African locales (as if there were one style that crosses ethnic and national boundaries). If unity is at the heart of Afrocentrism, what if we asked what unites Africans, African migrants, Afro-Canadians, and African-Americans today—rather than relying on a common past? What would Kwanzaa look like if it tried to connect with Africans, and not just Africa? You don’t need to search for us in the Motherland. We’re all up in the U.S. So get at us. Nikki Yeboah has a PhD from Northwestern University, and is a former journalist for the Ghanaian newspaper, The Statesman. She goes back and forth between Ghana, Canada, and the U.S.A., but right now, you can find her in Toronto for the holidays.